Magpies are passerine birds of the crow family, Corvidae. In Europe, "magpie" is often used by English speakers as a synonym for the European Magpie, as there are no other magpies in Europe outside Iberia. That bird was referred to as a "pie" until the late sixteenth century when the feminine name "mag" was added to the beginning. The European Magpie is one of the few animal species known to be able to recognize itself in a mirror test. According to analysis, magpies do not form the monophyletic group they are traditionally believed to be—a long tail has certainly elongated (or shortened) independently in multiple lineages of corvid birds. Among the traditional magpies, there appear to be two distinct lineages: one consists of Holarctic species with black/white coloration and is probably closely related to crows and Eurasian jays. 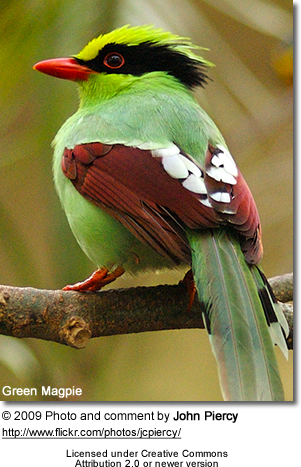 The other contains several species from South to East Asia with vivid coloration which is predominantly green or blue. 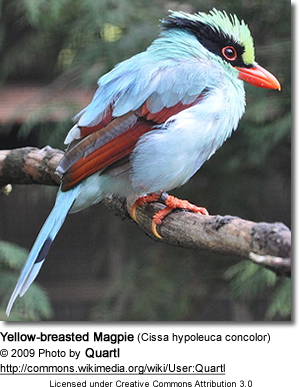 The Azure-winged Magpie is a species with a most peculiar distribution and unclear relationships. It may be the single survivor of a long extinct group of corvid genera. Other research has cast doubt on the taxonomy of the Pica magpies, since it appears that P. hudsonia and P. nuttalli may not be different species, whereas the Korean race of P. pica is genetically very distinct from the other Eurasian (as well as the North American) forms. Either the North American, Korean, and remaining Eurasian forms are accepted as three or four separate species, or there exists only a single species, Pica pica. 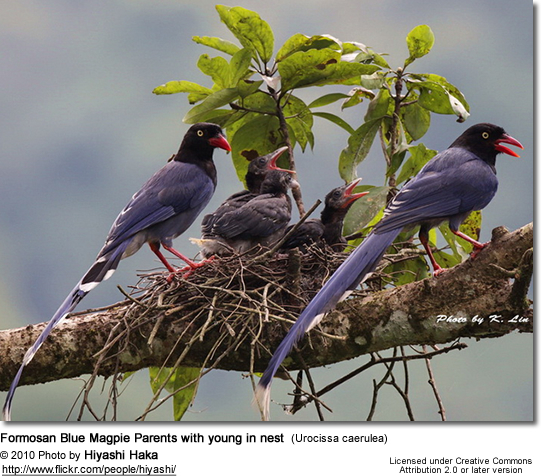 The Black Magpie, Platysmurus leucopterus, despite its name, is neither a magpie nor, as was long believed, a jay, but a treepie. Treepies are a distinct group of corvids externally similar to magpies. The Australian Magpie, Cracticus tibicen, is conspicuously piebald, with black and white plumage reminiscent of a European Magpie. It is a member of the family Artamidae, and not a corvid. Anonymous (2006): The Word Origin Calendar: Sat./Sun. March, 11-12, 2006. Accord Publishing. Ericson, Per G. P.; Jansén, Anna-Lee; Johansson, Ulf S. and Ekman, Jan (2005): Inter-generic relationships of the crows, jays, magpies and allied groups (Aves: Corvidae) based on nucleotide sequence data. Journal of Avian Biology 36: 222-234. Tickner, Lisa (1980-04-01). "One for sorrow, two for mirth". Oxford Art Journal. Retrieved 2007-03-02.